On The Faculty Lounge, an American law blog with a generously large corner for legal history, one can read this spring a series of postings about old cemeteries by Alfred Brophy, in itself part of his larger series on nineteenth century monuments from the South of the United States. Many of the monumental tombstones and cenotaphs are really works of art. Those monuments commemorating historical figures, and not in the least the lawyers among them, are shown by Brophy to be of great interest to legal historians. Musing on them I realized I live not far from a cemetery which admittedly cannot boast similar architectonic beauty and great historic significance, but one aspect of it definitely is of some importance for Dutch legal history. When looking for literature about it I noticed one of the authors who wrote about this cemetery has recently published a major study which deserves mentioning here. I will come back to him. A few kilometers to the north of the city of Utrecht lies the former village Oud-Zuilen, now a part of Maarssen. 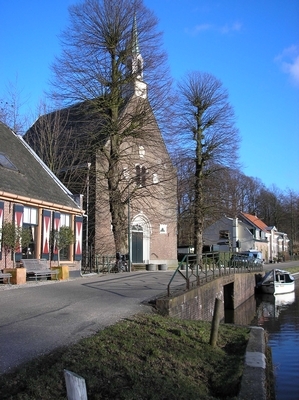 Oud-Zuilen is situated on the borders of the river Vecht. The village is dominated by the castle Slot Zuilen, and you can safely guess the lords of the castle have something to do with this cemetery as well. In 1781 the bailiff of Oud-Zuilen filed a request with the States of Utrecht asking them to allow the owners of the graves to create a cemetery, because they could not any more bury people inside the church of Oud-Zuilen due to growing stench and danger to people’s health. The request was answered very positively. The States of Utrecht authorized the bailiff to sell obligations to cover the costs of the new cemetery which was opened in 1782. 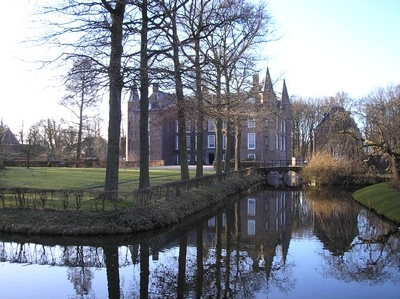 Willem René van Tuyll van Serooskerken, the lord of Oud-Zuilen, graciously donated the grounds for it. A treatise send in 1781 to the Utrecht Society for Sciences – the Provinciaal Utrechts Genootschap still exists – gives detailed information on the plans. Burying people in churches had long been normal practice, but during the eighteenth century people started to feel more and more awkward about it. The initiative at Zuilen was welcomed most heartily by the Hollandsche Maatschappij der Wetenschappen, the Academy of Sciences in Holland, which awarded baronet Van Tuyll van Serooskerken a prize in 1783. The new Dutch digital library Early Dutch Books Online yields quickly at least two booklets on public cemeteries, a sermon by W.A. Ockerse from 1792, Het begraven der dooden buiten de kerk en stadspoorten (…), and the inaugural lecture (Inwijingsrede…) by historian Adriaan Kluit (1735-1807) from 1776 as a professor of Greek and rhetorics at the Athenaeum Illustre in Middelburg, of which text a Dutch translation from the Latin original was published in 1795. You can easily find more here about kerkhoven. 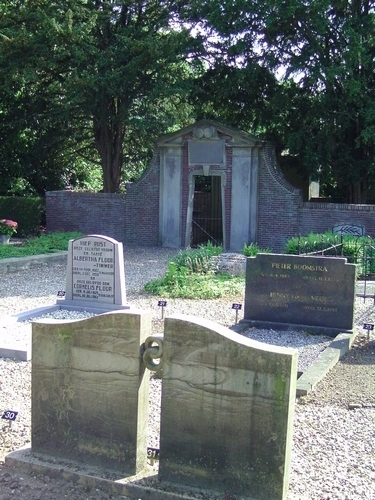 In 1795 the States of Holland decreed that burials were no longer allowed inside churches, and they incidentally curbed the pomp and circumstances accompanying burials. During the period of Batavian Republic (1795-1806) a law was passed in 1804 forbidding burials in churches. However, in 1813 this law was repealed, and only in 1825 burying people in churches became definitely unlawful. 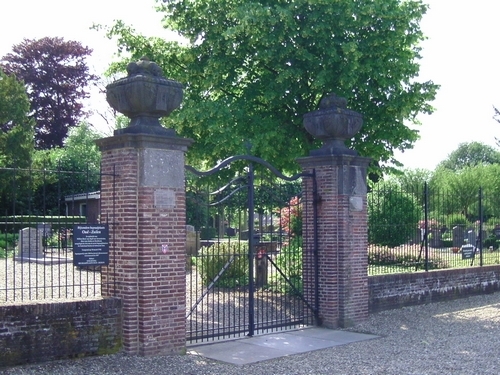 It seems the cemetery of Oud-Zuilen is the first Dutch cemetery outside a town. Members of the Van Tuyll van Serooskerken family figure prominently among the people buried on this cemetery. In fact the family has created a family vault with an imposing monument, and a part of the cemetery is still reserved for this family. However, the most famous member of this family, Belle van Zuylen (1740-1805), better known as Isabelle de Charrière, was not buried here but in Le Colombier (Switzerland). I cannot stop myself showing you at least one photo of Slot Zuilen. Inside the castle you can visit the main hall with a beautiful seventeenth century gobelin tapestry. One of the rooms has been kept in the style of the late eighteenth century, with the harpsichord and writing desk helping you to imagine Belle van Zuylen writing her letters and novels, playing the harpsichord and composing music. Back to the cemetery! 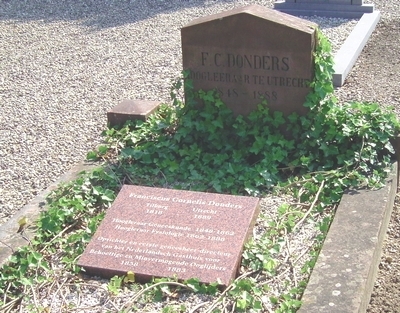 One of the most famous Dutch people buried at Oud-Zuilen is Frederik Cornelis Donders (1811-1889). From 1848 to 1862 he was a professor of medicine at Utrecht University, and in 1862 he switched to the chair for physiology. Donders’ life is an example of growing professionalism. Within the field of physiology he concentrated on eye patients and founded an ophthalmic hospital. This building in Utrecht looks very much akin to the Amsterdam Rijksmuseum and the main railway station, but only on a much smaller scale… You can see a part of the monument for Donders at the Janskerkhof on a picture in an earlier post. 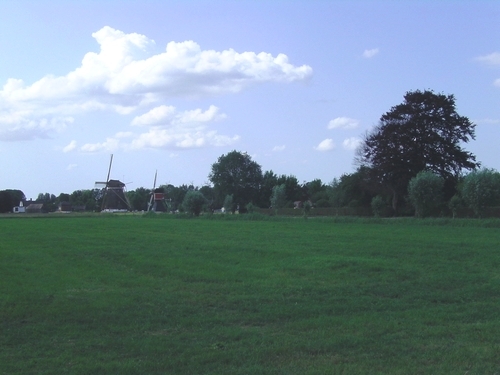 At the end of this post I have put on purpose this picture of the Oud-Zuilen cemetery with on the left two windmills. One of them figured this year in a posting on the history of waterboards. Since 1997 much has been done to restore this cemetery to its former beauty. In 2005-2006 the family vault of the Van Tuyll’s has been restored. The inscriptions at the entrance “Wij leven” and “Wij sterven” (We live – We die) have been left in their present dilapidated state, but the inscriptions are now also shown on two glass plates. J.G. van Citters-Eymert published in 1972 a pioneer study on this cemetery – ‘Zuilen voorop met openbare begraafplaats’ [Zuilen ahead with public cemetery], Maandblad Oud-Utrecht 45 (1972) 90-91. Hein Vera, ‘200 jaar Algemene Begraafplaats Zuilen’, Maandblad Oud-Utrecht 55 (1982) 13-14, commemorated the bicentenary of the cemetery. I have used both articles for writing this post. Bibliographical research for the history of the city, diocese and province of Utrecht is made easier by the Sabine website. On June 9, 2011, Hein Vera defended in public his Ph.D. thesis at the Radboud Universiteit Nijmegen on the history of the commons in the region around Bois-le-Duc from 1000 to 2000 (….Dat men het goed van den ongeboornen niet mag verkoopen. Gemene gronden in de Meierij van Den Bosch tussen hertog en hertgang 1000 – 2000) (Oisterwijk 2011). Hein Vera is well-known for his tireless efforts behind the portal GeneaKnowhowNet. One of its offsprings is Regulations in the Netherlands with now some 2300 transcriptions of sources for legal history from the Low Countries. Congratulations! This entry was posted in General and tagged Cemeteries, Legal history, Netherlands, Public law, Utrecht on June 16, 2011 by rechtsgeschiedenis.